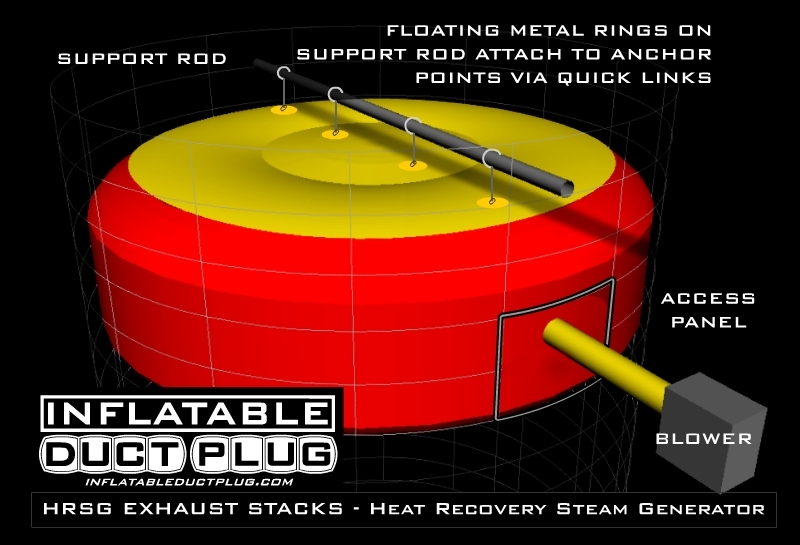 Using a HRSG Stack balloon plug from Perpetual Evolution Designs can be very beneficial in cost savings. Fuel and startup times can be decreased, while keeping the unit warm during off line periods. These balloons are fairly easy to install once the support system has been designed and is in place. We only offer the inflatable and it's inflation fan. All other supporting elements need to be purchased from vendors who deal with fabrication and after market modifications to this style of equipment, in these environments. This includes having an after market panel or door cut into the stack for this use. Once the hanging system is in place, the inflatable can be inserted in approximately 15 minutes. This includes unfolding the fabric, attaching connection points to floating rings using quick links, checking zippers and connecting the inflation tube to the blower. Removal is the same process in reverse steps and takes approximately the same amount of time. Zippers are installed so that they open towards the operator and allow for fast removal. Once installed and inflated, the stack balloon can help shield steel parts that would otherwise remain exposed to elements that would cause these parts to rust and break down. The fabric used for these is a water repellent 400 denier pack cloth that's made to accept the abuse of rain and moisture. If moisture on the blocked side of the stack is an issue, we can build in a pass through that allows humidity to escape the stack. These products, like other duct plug inflatables, require a constant source of air via an electric powered inflation fan. This fan can be located away from the inflatable by allowing it to feed the plug w/ air through an 8" diameter flexible blo-n-vent hose w/ wear strips. These hoses can be as long as 75' and still function properly. It's important to note that the inflation fan needs to breathe and cannot be completely dog-housed w/ out proper ventilation. When storing the inflatable duct plug, it's important to make sure it's dry before packing and rolling for storage. Fabric put away wet is subject to mildew and decay at an alarming rate. 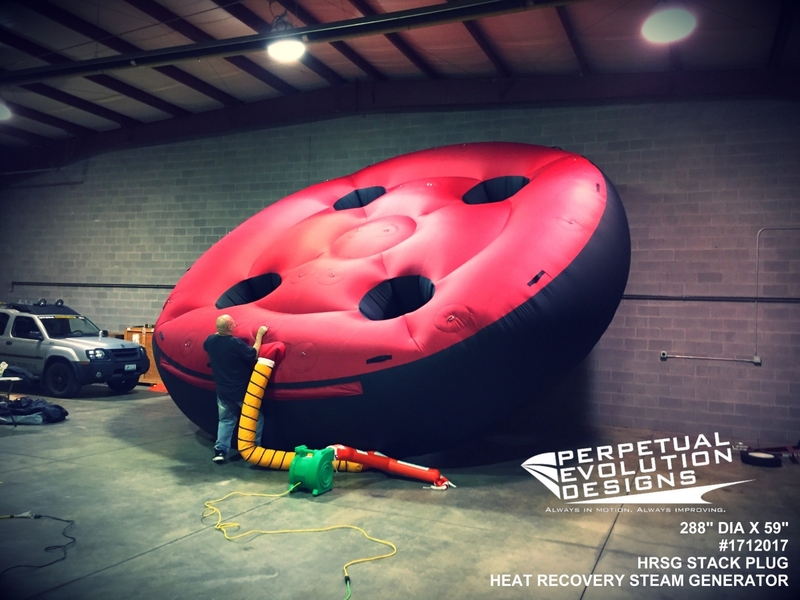 Moving the inflatable to an unused portion of the plant and allowing to be inflated while drying indoors for 24-48 hours is a good idea.